The finals of the New Japan Cup tournament took place on Wednesday from Nagaoka and featured Hiroshi Tanahashi attempting to win his third tournament as he took on Zack Sabre Jr.
Zack Sabre Jr. won the New Japan Cup tournament on Wednesday morning after submitting Hiroshi Tanahashi in the main event in Nagaoka. The match saw Sabre attack the right arm and knee of Tanahashi, culminating in the closing stretch when Tanahashi landed a High Fly Flow to the back and attempted a follow-up, missed Sabre with the High Fly Flow and landed on the injured knee. After kicking out of a bridge from an O’Connor roll, Sabre locked on the “Orienteering with Napalm Death” submission and Tanahashi instantly tapped as it was fully applied at 32:02 of the match. After the match, Sabre announced that he wanted to face Kazuchika Okada for the IWGP heavyweight title and the two will headline Sakura Genesis on April 1st at Sumo Hall. The tournament was a tremendous success in establishing Sabre as a top-flight heavyweight contender with submission victories over Tetsuya Naito, Kota Ibushi, Seiya Sanada, and Hiroshi Tanahashi and will go down as one of the most effective two-weeks of booking in recent memory, taking someone from a mid-card role and bring thrust into the upper echelon of their promotion. 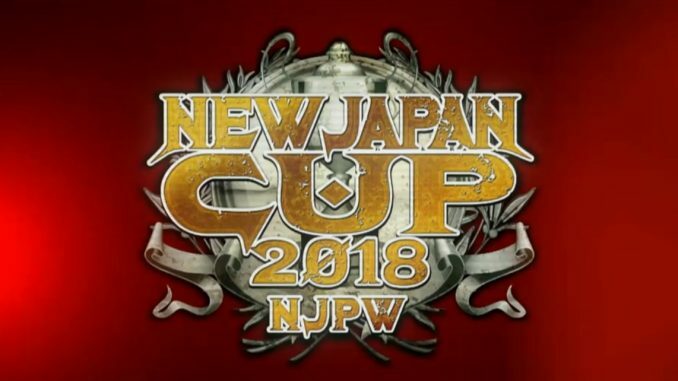 This was the 14th version of the New Japan Cup, which began in 2005. The following year they added a stipulation that the winner would receive a title shot.